I’ve been thinking lately about the attention that surrounded the death of Philip Seymour Hoffman. It seems like it was divided into two categories: first, he was a victim of a horrible disease and a world filled with pressures, cruelty, and vice; or second, he was a selfish star who chose to abuse drugs that ended his life. And the story goes if you subscribe to version number one you are compassionate and understanding, and if you agree with number two you are callous and uncaring. Trouble with this is that they’re both judgments. Labels placed on the life of a man, who, like you and me, was living the human experience – perfectly imperfect. And ultimately those judgments aren’t really placed on him; they’re judgments of ourselves and of our own experiences that we are ashamed of. In the end we are all Philip Seymour Hoffman … and we are all the Buddha. And therein lies the trouble for our human brain, which wants to constantly compare and contrast. We have such trouble accepting the paradoxical truth – that it is all us. Our human experience spans the entire spectrum from the lowest vibrational act to the highest. But our brain, always looking to create a story by contrast, wants to make the Buddha in us holy with a capital H, and this is expressed usually as holier-than-thou judgments on others and, by default, ourselves. All the while, the Philip Seymour Hoffman in us just wants to be loved. But it can’t be because we’re so busy judging ourselves that we end up crying out in desperate pain, which is often expressed though addiction to alcohol, drugs, food, work, drama, noise … or all of the above. And in case you think I am writing this from a holier-than-thou judgment place, I’m not. I am writing this from the piece of me that is Philip Seymour Hoffman, from the hurt little boy in me who always just wanted to be loved. The one who worked and worked and worked to be as good as he could possibly be in hopes that the world would love him. And the same little boy who, overwhelmed by the immense pressure of it all, often turned to worldly poisons to distract himself from the pain. There is no doubt that many of the things Hoffman is said to have done are very low on the vibrational scale of the world. Drugs, excessive alcohol, and infidelity are all very low vibrational activities. But you know what the lowest is? And this is science not woo-woo. The lowest vibrations are guilt and shame. That’s right. The very emotions that we heap on ourselves like toppings at the frozen yogurt shop are actually worse for us than the acts we associate with them. So what is the solution? 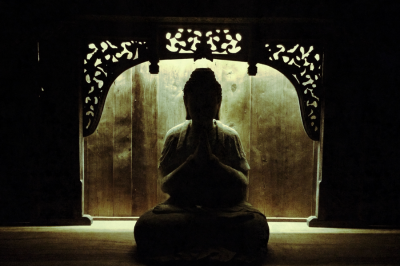 Deny it all and pretend to be just the Buddha? Give in and end tragically in a hotel room with 50 bags of heroin? The answer is simply LOVE. To give ourselves exactly what we are craving underneath it all … LOVE. And how do we do this? How do we heal the hurt child inside? How do we, in the middle of our chaotic lives chock-full with responsibilities and must-dos, find time to love ourselves? I have found a simple yet profound exercise that can be done at home and is deeply healing. It will feel odd at first. Funny eh, how odd it is to love yourself? But if you relax into it and allow yourself to truly love, I think you’ll find as I did that this is extremely healing. To begin, turn off your phone, computer, The Kardashians, Twitter, Facebook, bat phone, and every other thing that will try desperately to pull you back into caring for something besides yourself. Put on some soothing meditation music and lie down on your bed. Lie flat on your back and cross your ankles one over the other (let your body decide which way feels best – right over left or left over right). Then cross your arms across your chest like a giant hug from you to you. Roll onto your left side and draw your legs up into the fetal position, the way a small child sleeps. With your left hand gently caress your right shoulder the way a nurturing mother would care for her child. Do this for a few minutes. Really feel the words, both the saying of them and the receiving. You are the giver and the receiver of the love in this. You, the adult, are assuring you, the child, that you are loved. Now we will add in some breathing and releasing of old traumas. “I love you for who you are, not what you do. I will always care for you.” Deep breath in … breathing in with the mantra “in with love and forgiveness” … then a long exhale, breathing out the guilt and pain with words that describe it. To demonstrate I will give you some real life examples from my own life. I am sharing this because I want you to see we are all the same. That we have shared fears, angers, guilt, and shame. If tears come, welcome them. Comfort yourself the way you would a little child, the little you. Just breathe in soothing love and release the pain. After a while the words become unnecessary and you simply drift into a state of self-love. I find it really soothing at this point to just whisper over and over again. We are all carrying around guilt and shame and fear and anger. These are the lowest vibrations. They are the cause of immeasurable dis-ease or disease in our beings. Yogi Bhajan once said, “If there is any such thing as sin in this world … it is to feel guilty about anything. Guilt blocks all learning from experiencing a mistake and instead, asks for sympathy.” What did he mean? He was saying that we are all human, that we are in these bodies to experience, to learn, to grow. That requires what we call mistakes and failures. Without that we never experience, we don’t learn and we can’t grow. So throwing guilt at ourselves defeats the purpose of our existence and dooms us to life of disease, depression, anger, deep fear, etc. So today, go ahead and remember Philip Seymour Hoffman. Not the actor. Not the drug addict. Not even the man or father or son that he was in this incarnation. Rather remember him as the part of you that needs love today. And then find a moment to give yourself that gift. And in doing so you heal not just yourself, but a piece of us all. thank you for this. it is exactly what i needed right now. What a powerful, loving message and ritual of self acceptance. I love the spirit of men like you Jason. Men who understand that there is power in tenderness, and strength in gentleness. Thank you for this I will do it for myself (great timing for me with Mother’s Day coming). And thank you for giving me faith and renewed hope that there are men in this world with spirits like yours. I open my heart to this kind of divine masculinity. All the best to you and your family!